BNP Paribas is the world’s No. 1 tennis sponsor. BNP Paribas has been partnering tennis with unrivalled enthusiasm for more than 40 years all over the world. Its loyalty as a sports sponsor mirrors the relationship that it is determined to forge with its clients: a relationship based on long-term trust. 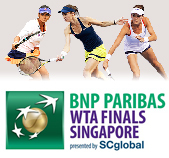 BNP Paribas WTA Finals Singapore presented by SC Global was staged at the state-of-the-art Singapore Sports Hub on October, 2014 – the first time an Asia-Pacific city has played host. The Finals will once again be hosted on Sunday 25th Oct to Sunday 1st Nov, 2015. BNP Paribas was the Diamond Sponsor of the Shanghai Rolex Masters in 2010-2012. Through our dedicated involvement in this tournament, we confirm our dedication and enthusiasm towards tennis, and our commitment to our clients in China.